2nd Bn, The Duke of Edinburgh's (Wiltshire Regiment), 58th Brigade, 19th Division, B.E.F. Phillip Panting is commemorated on the Soissons Memorial. This memorial commemorates the men who were killed in the Battles of the Aisne and the Marne, 1918, in which comparatively small bodies of British troops played a conspicuous part in defeat and in victory. The original British Expeditionary Force crossed the Aisne in August 1914 a few kilometres West of Soissons, and re-crossed it in September a few kilometres East. The city remained for three and a half years within the range of German artillery, and more than once comparatively slight movements of the French and German front lines on the Aisne were purchased by weeks of desperate fighting and intense bombardment. From the end of May 1918 to the beginning of the following August Soissons was again in German hands, and it is to the British losses of that period that the Memorial relates. There are now nearly 4,000, 1914-18 war casualties commemorated on this memorial. 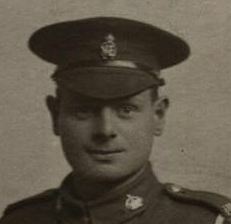 The picture of him in Wiltshire Regiment uniform shows him wearing the badge of a Lewis Gunner.